We received a Calmz Anxiety Relief System at no charge. Pawsitively Pets only shares information we feel is relevant to our readers. All opinions are our own. Over 24 million dogs in the US suffer from regular canine anxiety, mine included. Shiner's anxiety isn't too bad, but is usually triggered when I leave her home alone. She also used to get anxious during storms. However, she doesn't hear well anymore and I don't notice anxious behaviors from her during storms. During my trip to the BlogPaws conference, I learned about a very cool new product from PetMate - the Calmz® Anxiety Relief Sysem for dogs. It is an adjustable vest that cradles a device over specific acupuncture points on a dog's spine. When the device is turned on, the dog hears and feels a blend of therapeutic classical music, tones, and vibrations. Canine anxiety can be caused by all kinds of triggers including fireworks, storms, loud noises, separation, car rides and more. When Shiner becomes anxious from separation, she will usually vocalize with loud howls and whining noises. She may also scratch or chew at doors and have destructive behavior. Many times, I have come home to a chewed up pillow on the bed. The Calmz Anxiety Relief System comes with a vest that fits your dog like a harness would. The material is extremely soft and stretchy. It's meant to fit nice and snug on your dog to provide comfort. The Calmz device uses clinically proven NeuroSync™ Technology that helps calm and soothe your dog's anxiety. 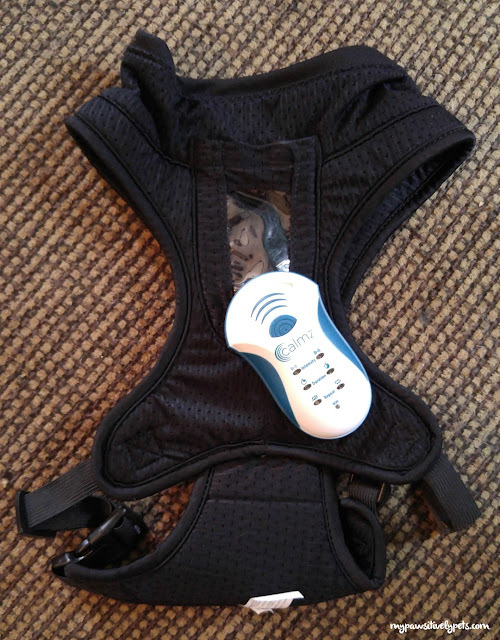 The device vibrates gently over acupuncture points on your dog's spine. It also plays classical music and tones. There are several settings for the Calmz device. You can turn up the vibrations and music, as well as set them to repeat. It does run off of batteries. It's user friendly and easy to figure out. You can learn more about how the Calmz Anxiety Relief System works in the video below. Shiner does not mind wearing her Calmz vest and device at all. She also had no negative reactions when I turned the device on for the first time and seemed to enjoy it. She actually took a nap after I turned it on and did seem relaxed. I like using our new Calmz and I turn it on for her at least once a day now. For information about Calmz Anxiety Relief System and to purchase one for your dog, visit the Calmz website HERE. 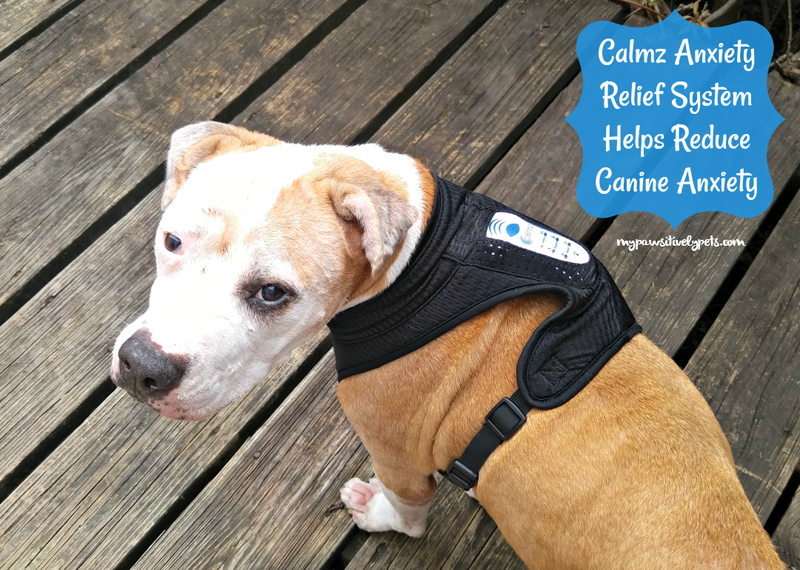 We are partnering with Petmate to give away one Calmz Anxiety Relief System. The giveaway is open to US residents only (void where prohibited by law), ages 18+. Giveaway ends on June 10, 2017 at midnight CT. To enter, simply fill out the Rafflecopter form below with as many entry options as you like. Good luck! Two of my three rescued Treeing Walker Coonhounds are especially frightened of thunder, fireworks, etc. While we don't know exactly what they experienced before I adopted them from high-kill shelters in NC and SC, it's likely they were used for hunting (perhaps were not good hunters and therefore dumped at the shelters). I've used Thundershirts and various other products, but am still looking for what will work best for them. The last thing I want to do is get doggy tranquilizers from the vet for them. I want them calm, but not knocked out. My young girl gets so stressed at shows & even gets a messed up stomach. We go to lots of shows & have tried oils, special treats, jackets, with minimal improvement. I would really like to help her overcome her stress of traveling. I would like to try this because my one dog gets very nervous at the Veterinarian and when she gets her nails done and doesn't get affected by sedatives so she needs to be muzzled but she's still anxious. Mr. N has separation anxiety so I'm wondering if this might help! I have a sweet pitty miss that has extreme separation anxiety. He's had 4 different homes before me and sees me leaving as a forever thing. I would love to help give him some peace while we work in his issues. i just got an email abt this product. i have seen it b4 and am very interested in trying it. i would love to try it on my oldest to see if it would help her travel easier. with her having dementia, being almost blind and deaf, she does not travel well anymore. i would also like to try one on my 2 younger girls that cant stand thunder storms, fireworks, and lightning. Our doxie gets anxious during storms and when people use fireworks, so I would like to try this for him. One of my Boston's is scared of storms and loud noises. He also get really crazy when our mailman comes by. Yes, my one dogs has storm anxiety, so this would be great to try. Thanks! I think that's the coolest thing ever! It will probably help hundreds of puppies. One of my 3 dogs has extreme storm and noise anxiety. It would be great to see if this helps. My dog has severe anxiety. He's on prescription medication but still has some issues with his anxiety. I'd love to try this for him. My dog Sabre is a great dog and great with me, but because she was rescued from an abusive man, she gets anxious around my hubby...She is a pretty good size dog and she tends to want to protect me and she gets nervous if my husband sits next to me...she is coming along pretty good but after 2 years, I would love to help her more, but just knowing she is now safe is also a great outcome....Good luck to all!! I would like this for our older dog that experiences anxiety when there are storms or when company comes that he doesn't know.